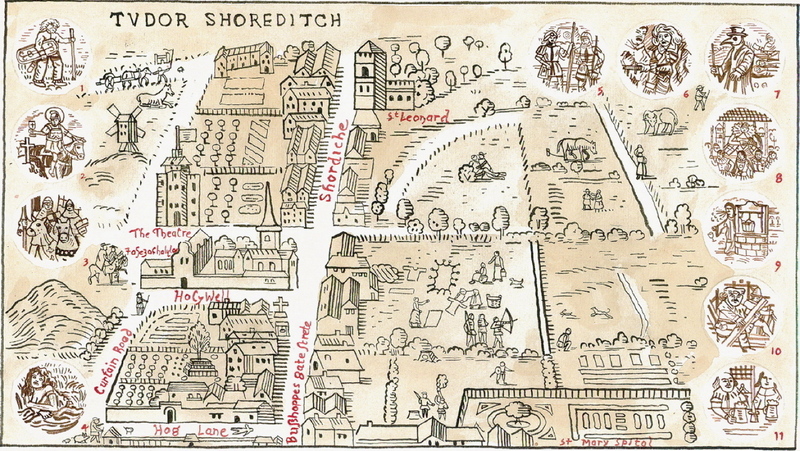 It is my delight to publish Adam Dant‘s map drawn to celebrate the centenary of the newly renovated Arnold Circus bandstand. Nice article – he should do a ‘future shoreditch’ one…. Picked one of these up yesterday at the lovely celebrations marking not only the centenary but such great achievements by the Friends of Arnold Circus. Also got one of your news sheets. Was hoping for a ‘Lobby Lud’ moment but I hope you had a good time and got some cake. We particularly enjoyed the music and the smells of the old Jago – my middle child made up such a smelly concoction that we had to abandon his twist of scented cloth in a bin on the way home. Gentle Author – thanks for this great post. These maps are amazing and inspiring and – like Barbara (above) – I’d really like to take a closer look at the real thing. 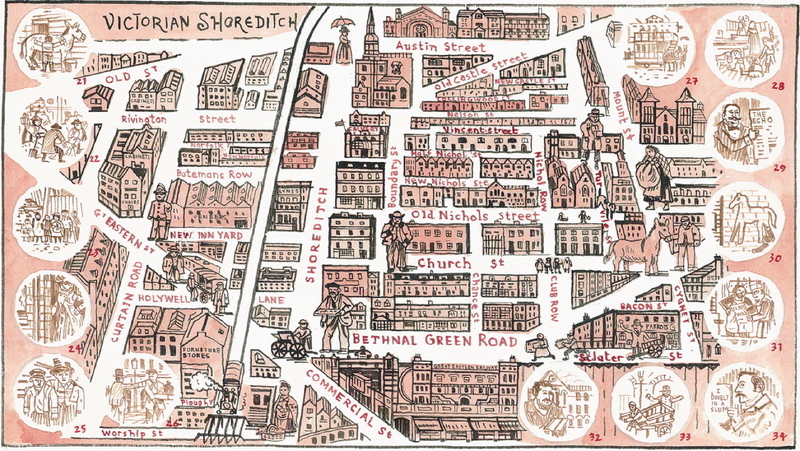 Copies of Adam Dant’s map are now available for a limited period at Leila’s Cafe in Calvert Avenue next to Arnold Circus. The maps are great! I’m from South Africa and my paternal forbears, going back to 1749, came from Shoreditch—-Hog Lane to be exact! Marriage and baptisms at St Leonard. Thanks for the insight your maps have given. Am I far too late to obtain a copy of your map? This was a wonderful discovery for my family! We still have some copies available, Marcelle. I love these maps and the information on this web page. I worked around this area in the early 1990s and have very fond memories of the time. I love to visit this area of London. 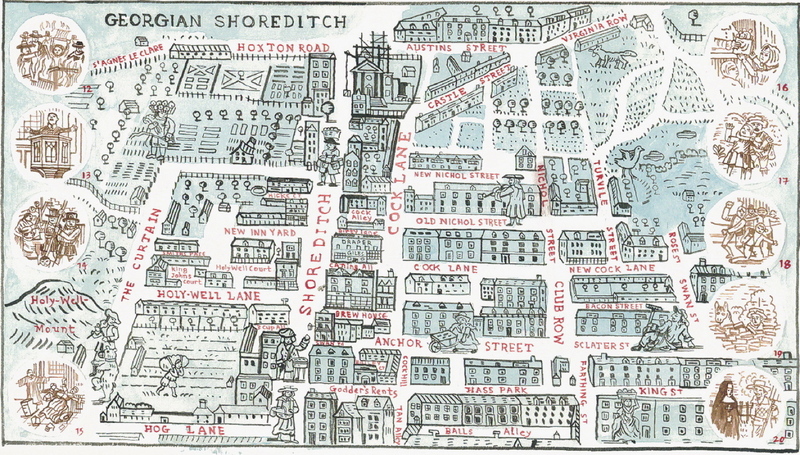 of different stages in history of shoreditch appeal to me. I absolutely love these maps. Are copies available for purchase anywhere? 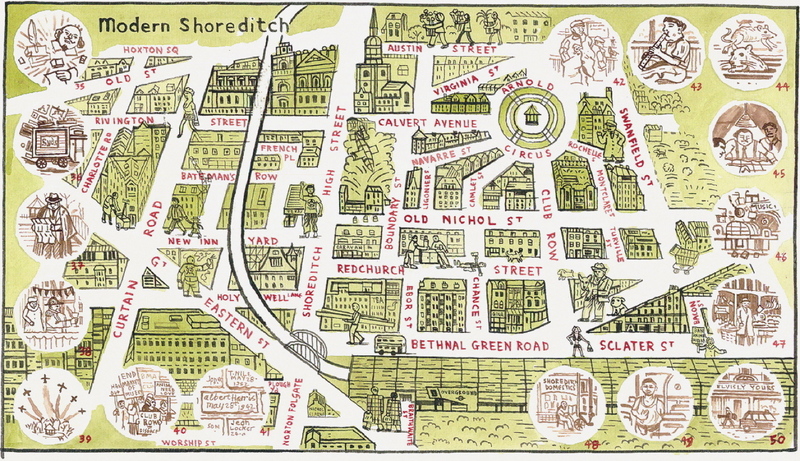 The maps are just great, I lived in Shoreditch ( Hoxton to be exact). I would love to purchase A copy of these maps. is it possible ? Wonderful maps and delightful little history items. But woefully amiss when it comes to Christopher Marlowe. Why do you Brits who are so erudite in most matters disparage Marlowe – the greatest English poet – over and over again??? He did NOT kill William Bradley. His friend Tom Watson did. Bradley started a fight with Marlowe in Hog Lane, swords were drawn, then Watson appeared and Bradley went after him saying, “Art thou now come, then I will have a bout with thee.” Bradley was angry with Watson for siding with others who were trying to collect a debt from Bradley. Bradley wounded Watson, but Watson then ran him through the heart, killing him. Both Marlowe and Watson waited for the Constables to arrive and both were taken to Newgate gaol. Marlowe was released on a Queen’s pardon after 13 days and Watson’s plea of self defense was accepted on 12 February, 1589/90 a full 5 months later. Christopher Marlowe was not a homosexual ‘roaring boy’, not a counterfeiter, not a wastrel and not a scurrilous good-for-nothing. He was an important agent in the service of the Queen, the creator of blank verse, the history play and the greatest poet of the Elizabethan Age. It’s about time you folks wised up and began to honor this great Englishman.